Dean Crawford reflects on his experience at the annual Kentucky Supreme Court review during the KBA Convention. 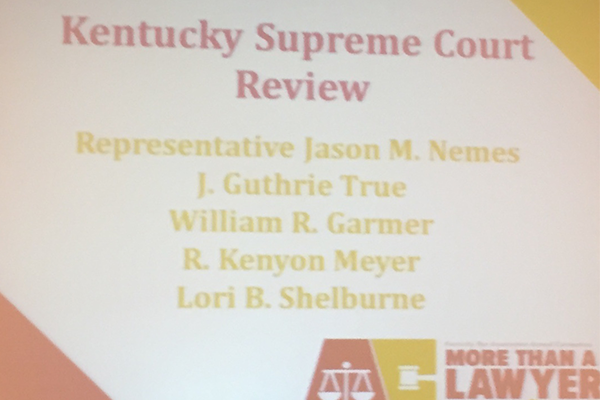 The KBA Convention ended for me with a marathon but rich and interesting session – the annual Kentucky Supreme Court review. The moderator was our 2004 alum, State Representative Jason Nemes. Rep. Nemes has become the Kentucky Bar’s unofficial statistician, and his breakdown of cases and decisions was enlightening. Most interesting to me was his observation that the Court’s decision show high degrees of collegiality. To be sure, there is dissent and disagreement among the Justices, Rep. Nemes observed, but far fewer of the sharp divisions we see on many federal tribunals, including, notably, the U.S. Supreme Court. Rep. Nemes began with some provocative and interesting comments – in line with things I have heard at lawyer events outside Kentucky. Specifically, he noted the decline in jury trials, which may be the result of increasing reliance on arbitration and mediation. Though Rep. Nemes did not say so, I know that many lawyers worry about this trend because it results in less written law – and in a legal system that relies on stare decisis that is a concern. Rep. Nemes also noted a worry that the Supreme Court docket increasingly was devoted disproportionately to criminal and employment law cases – again a likely result of increased reliance on out-of-court settlement by other means. For the reasons I note above, such a trend must concern us. Constitutional: the Court examined whether a university could claim sovereign immunity when faced with an employee’s claim against it. There were many others, including some novel issues – or at least novel to me. The criminal law commentator, for example, examined cases on “prosecutorial vindictiveness” and the reach of the doctrine of “collective knowledge” among law enforcement officers. These were entirely new notions to me. Another, civil case considered whether, in a constitutional Equal Protection case, back pay could be considered an equitable remedy. Pay as an equitable remedy! All of these were reminders of the way law and legal arguments constantly evolve. For this teacher of Property, however, the case that most interested me came at the end of the session, in a presentation by our 1995 alum and Dinsmore partner, Kenyon Meyer. Kenyon reviewed a case where a plaintiff exercised a right to purchase real property. The parties disagreed as to the amount and the case went to litigation. The Court ordered specific performance at a particular price, even though the defendant objected to the price. But the defendant-seller conveyed a general warranty deed and, the Court concluded, had not taken any one of a number of actions to preserve his objections to the sale. That is enough to keep any real estate lawyer awake at night. At the end of the session, I almost wanted to be back in law school again – as a student.